We will be at several events throughout 2015.
college has the best value, best quality contracts. that works across multiple campuses? schedule in the work and receive the best value contracts. 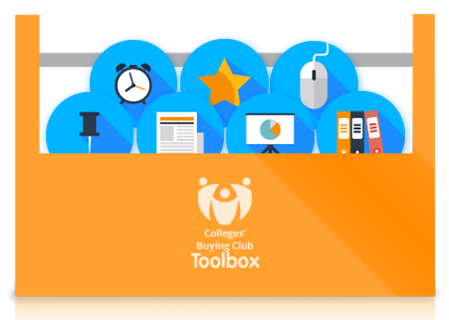 Colleges’ Buying Club is a procurement club that offers its members advice and help on how and when to buy most effectively in order that maximum savings and time efficiencies can be achieved. If you have a tender that needs to be taken to market, one of the Club’s dedicated procurement experts will work alongside you to write the specification, issue it to the European Journal and evaluate the submitted bids to your criteria. In addition, our Consultancy Service is here to help you with a range of support, from renegotiation of service terms & conditions to contract management, as well as multi-campus procurement strategy development. South Staffordshire College has been working with Colleges’ Buying Club over the last two years on a range of procurement requirements. The College was looking to source a new audit contract as their existing contract was coming to a natural end. They wanted to maximise an allocated grant of £600,000 in order to purchase new curriculum engineering equipment with specifications which they thought would be unaffordable and the College also needed support with a catering contract across their four campuses and a sponsored Academy. © 2014 Colleges’ Buying Club. All Rights Reserved. Place Group Limited trading as Colleges’ Buying Club.